Welcome to Ralf and congratulations with the first publication at Julia’s Fairies! It is impossible in some schemes, but I prefer twins in which it is NOT readily apparent why the other solution does not work. This nice problem unfortunately suffers from the comparison of precedents in the 9th WCCT award ! 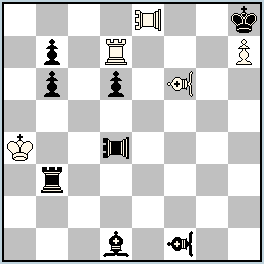 Nice black moves towards wK with switchback mates. There is at least one 9th-WCCT problem (I.Kirchner, 18th-20th pl.) with a similar content but with the more complex reciprocal functions of black pieces. Here, the twin with moving the thematic bPA makes the black play rather artificial. And bVAf1 is twice only a hurdle. Such use of a fairy piece is worse than it would be of an orthodox bBf1 (which, by the way, could guard b5 in a Meredith). The second example could easily have 2 solutions with 2 or 3 extra Pawns.